Spur gears make use of geometric curves, such as the involute curve which enables them to transmit power evenly and with a minimum of noise and friction. The introduction of the involute curve to the tooth profile allowed teeth in mesh to 'roll' together as if they were rolling on their respective pitch circles. The shape of the involute curve is not easy to manufacture and in fact varies according to the size of the gear being made. Brown and Sharp commercially made disc-type cutters which are readily available, but for any particular pressure angle(PA) and diametral pitch(DP), the user would need to purchase a set of eight cutters to cover the complete range of gear sizes for any particular DP or PA. Commercially available hobbing cutters probably provide the most accurate and fastest method of making spur gears however these cutters are very expensive and require a specialised hobbing machine to work and again each hob is specific to a specific PA and DP. is the name given to my adaptation of the Sunderland machine. Whilst it is diminutive to the extreme in size when compared with the Sunderland and uses a totally different mechanism it does follow the exact same principles as used in the full size Sunderland. The simplest and most intriguing method of making spur gears is to use a standard short rack which is easily and cheaply made using basic workshop equipment. Such a rack does however need to work in a specialist machine similar to and operating using the Sunderland Gear Planing machine principle. Because the short rack is so easy to make it was a good choice so long as a small machine could be designed and made to emulate the Sunderland operating principle. Such a machine would enable a large variety of gear teeth to be made by generating an accurate involute profile. 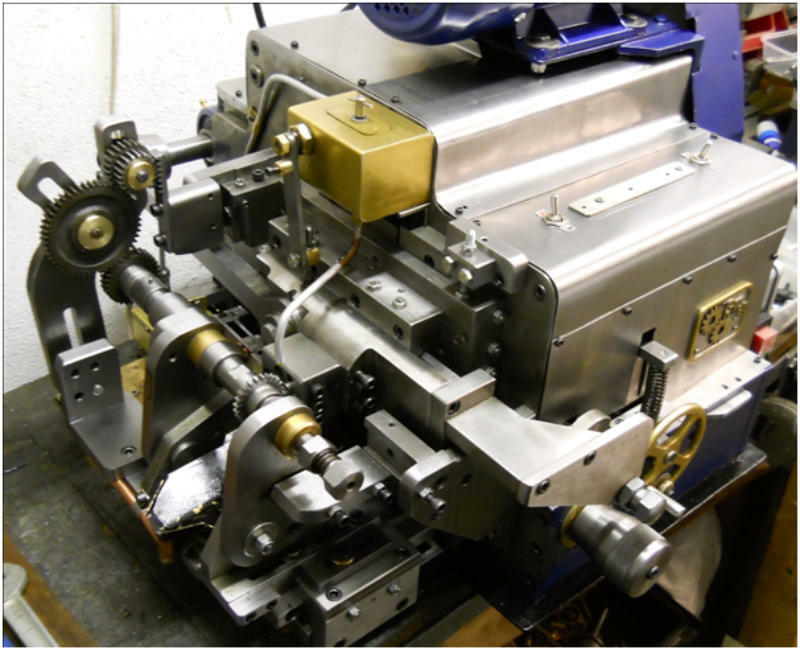 The actual machine prototype, being relatively small, can cope with many different gear teeth sizes (DP & Module). The model prototype Gear Generating Machine works using the Sunderland principle but varies in the detail design and operation when compared with the full size Sunderland planer. The machine is automatic and the main machine head comprises a vertical slide which incorporates a horizontal reciprocating rack-cutter. 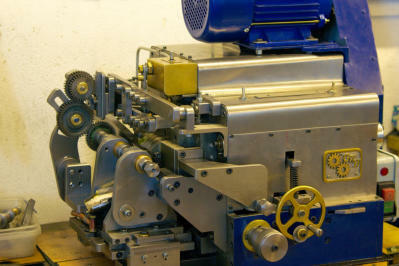 The gear blank is held on an arbor which fits in a support unit which can move in and out of engagement with the rack-cutter. The rotation of the gear blank and arbor is done by various methods but all make use of a rotation gear and rack mechanism. 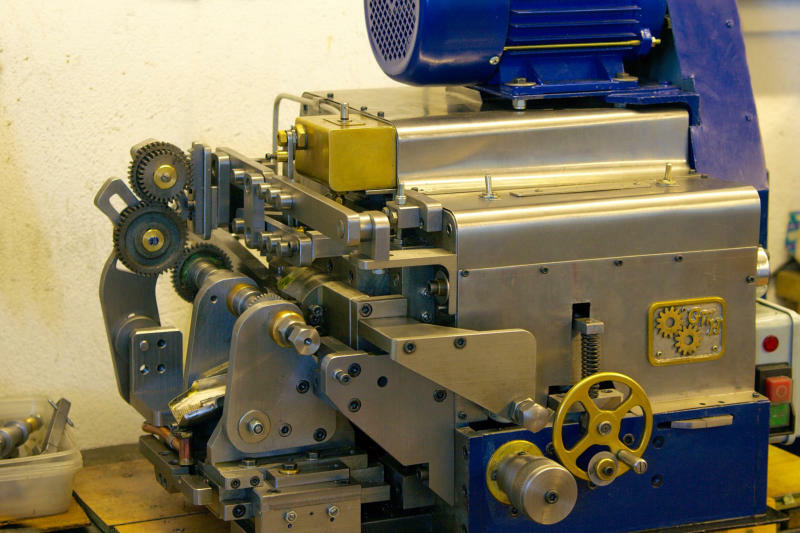 This approach whilst requiring a separate rotation gear and rack does provide a simple and accurate translation of the relative vertical movement of the cutter-rack to the rotation of the gear blank. The Sunderland full size machine does this using a set of change gears and worm drives but this approach is totally impracticable in the case of the small prototype due to limited space. 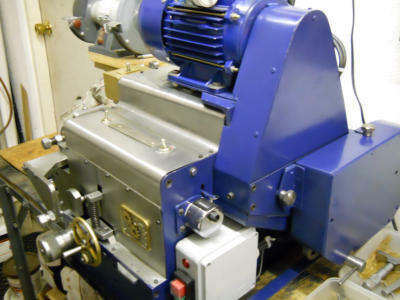 Finally, the prototype machine is designed to be 'true' to the spirit of the Sunderland Gear Planing machine and relies totally on mechanical devices to perform its emulation of the generation process.